industry since Ray worked on the Mica Dam exploration with his first D7E dozer in the late 1960’s. Since those early days, Speers Construction has worked on and around some of B.C. Hydro’s large dams as well as multiple independent “Run of the River” Hydro projects. Over the past 16 years, Speers Construction has been fortunate enough to develop good working relationships with B.C. Hydro (public sector provider), Canadian Hydro Developers/Trans Alta (a leader in the development of low impact “green power”) and Canadian Projects Ltd. (specializing in renewable energy development ventures). Hydro projects that Speers Construction has made varying contributions to are 10MW Akolkolex RV power project (1994), 45MW Pingston power project (2001-03), 25MW Mamquam power project (2004-05), 6.6MW Cranberry Creek power project (2006-07), 11MW X 2 Upper and Lower Clowhom power project (2008-09) and the 18MW Bone Creek power project (2009-10) now owned by Trans Alta. 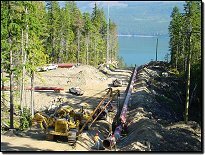 Our involvement in these projects has included site preparation, road construction, land and power line clearing, penstock installation as well as dam construction and other earth works. We look forward to utilizing our expertise in the continued development and growth of British Columbia’s private and public sector hydro resources.